Killer vest, ma’am. 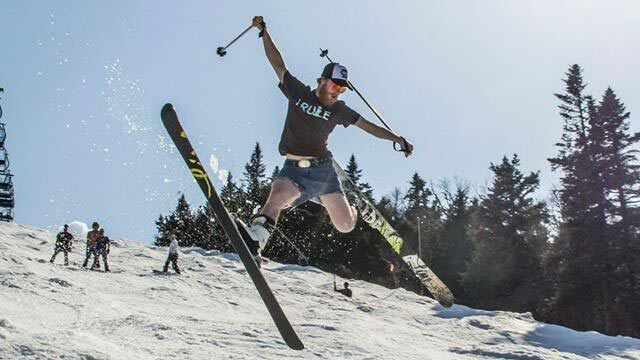 The East Coast is still all smiles as ski season rolls into May. PHOTO: Sunday River Facebook page. When the temperature is pushing 80 degrees, but there's still great snow cover on the mountain, the savvy recreationalist throws everything in the back of the truck and heads for the hills. "If I can ski and get in the boat in the same day, I'm taking the rest of the afternoon off," says Cort Roussel, who eschewed work for play Monday in Franconia, New Hampshire. After paddling his kayak around Echo Lake, Roussel donned skis and skins and headed up the slopes of adjacent Cannon Mountain. The ski area officially closed April 19, but there is still enough snow that Roussel skied from the 4,080-foot summit nearly back to the lake without hitting any bare spots. Across the state line in Vermont, Killington–aka "The Beast"–is the only ski area in New England still hawking lift tickets. And skiers are still happily paying up to ski down. Martha Wilson is normally cranking the pedals on her cyclocross bike by May, and her kids have moved on to lacrosse. But the family couldn't resist the lure of sunny skies and soft bumps at Killington last weekend. 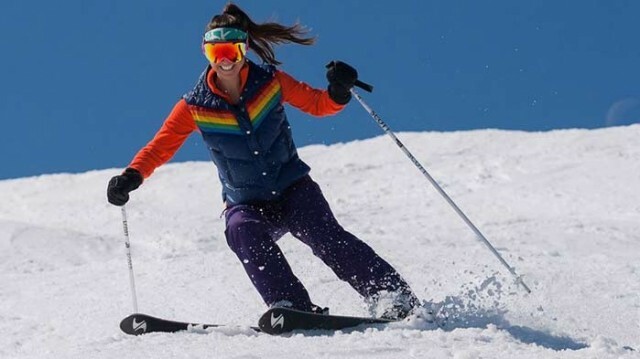 "After a relatively gray spring, the prospect of sunny skiing on ego bumps spurred us to scrape the summer wax off the skis and take them for one more ride," she says. "It's fun to say we've put in at least two days on snow each of the last seven calendar months!" Jay Peak celebrated spraffy season well into May this year. PHOTO: Andrew Lanoue. Following a winter of persistent sub-zero temps and, in some places, nearly record-breaking snowfall, several New England areas opted to stay open well into spring. In Maine, Sunday River and Sugarloaf kept the lifts spinning until last weekend. New Hampshire's Wildcat Mountain had a season just shy of six straight months, opening November 9 and closing May 3. And three Vermont areas remained open into May: Sugarbush, Jay Peak (with a reported 373 inches of natural snow for the season making it the most in the lower 48), and Killington. "'Spring' weather didn’t really arrive until the end of April," said Killington's Communications Manager Michael Joseph. "We had glades open the first weekend in May–that’s not normal. We might be skiing and riding all the way to June." The great snow and late closings translated to a bump in numbers for many areas. Both Wildcat and Killington reported increased skier visits. And at Cannon, which recorded the most snowfall of any New Hampshire area, General Manager John DeVivo said skier visits and revenues were up over last year, despite a couple of poorly timed weather events that hindered two traditionally busy weeks. "It was a great season for skiing," DeVivo said. "We're certainly happy we stayed open an extra two weeks. Lift service or no, there's still skiing to be had out there. "I don't think I'm quite done," Roussel said a day after his kayak-and-ski outing. "I didn't put the ski boots in the truck today, but I did throw the bike in. I may still get the trifecta: bike, ski, kayak."